Halloween is like project HEAVEN. I have 2 kids old enough to enjoy costumes and pick who or what they want to be. This year we will have Darth Vader (super excited about that one) And Bat Girl! Normally I like to rotate the types of projects I do, but since I'm doing costumes I'll have a lot of sewing posts coming up. I don't use patterns, so I'm talking a lot of pictures to help you understand how to do it, and tailor it to what you want. Today I'll show you how to make a cape, a full wrap around cloak type cape. These take a LOT of fabric, so I like to visit the thrift store and buy sheets. I can get a sheet for $3 or $4. Last year I got 2 black sheets. I have used them for several things (including an indoor chalk board superhero back drop scene), Now that I have cut them up I will be keeping my eye out for more black sheets. They are GREAT. We are going to fold it down to a triangle so you only have to make one small cut for the entire circle. 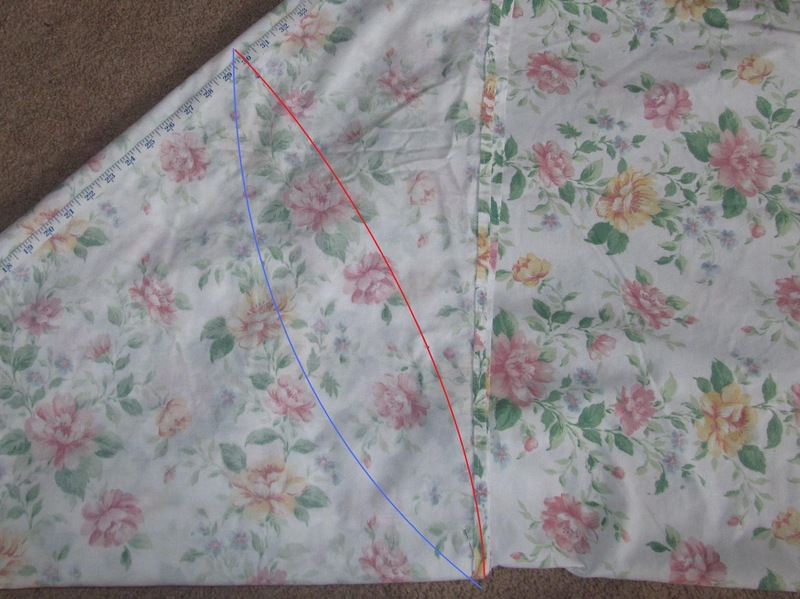 Now fold it in half so that you see the short edges, and the long excess of the sheet is on the inside of the fold. For the Vader cape, I cut along the red line, but for the bat girl cape, she wanted the pointed edges, so I cut along the blue line that is drawn. Then for the neck, cut a straight line up to the center and cut a small hole for the neck. Since this was an old fitted sheet, I cut off all the elastic, and used a piece of it at the top of the cape to easily slip it on and take it off. I just zig-zag stitched around the edges and the cape is ready to use. Nothing fancy, but a TON of fun. And I did a loop and button instead of elastic. I just found your blog via pinterest and had a question. I have to make a vampire cape and Im pretty sure your project will work, but where you said "Then for the neck, cut a straight line up to the center and cut a small hole for the neck." Where do you cut the straight line?? I'm not the best at sewing, and will be doing the sewing by hand, or using fray check. I want to do the bat girl version. Once you have the circle cut out, you can open it up and lay it out flat. Cut a line from the outside edge of the circle into the center. If you are doing the batman cape with the scalloped edges, then start your cut at the bottom of one of the points. Cut just to the center. and then cut a small circle out of the center. the small circle is like the "collar" of the cape. I hope that made sense! Awesome capes! What size sheet did you use? My son wants to be darth vader too and I am going to the thrift shop next week to see what I can find!